1.Preheat oven to 400°. Pat carrots dry with paper towel. In medium bowl, toss carrots, oil, and 3/4 teaspoon each salt and pepper; spread on rimmed baking pan. Roast carrots 30 minutes or until easily pierced with a fork, rotating once. 2.In blender, blend garlic, tahini, lemon juice, honey, paprika, coriander, 3 tablespoons warm water, and remaining 1/4 teaspoon each salt and pepper until smooth. Makes about 1/2 cup. 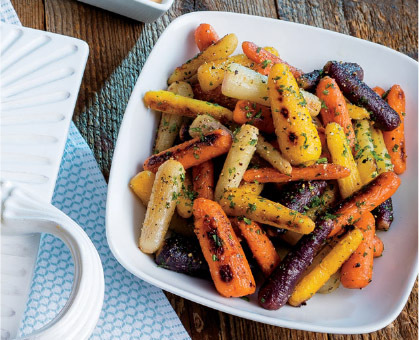 3.Serve carrots drizzled with tahini sauce sprinkled with parsley. > Rainbow carrots are not only gorgeous to look at, they are filled with unique nutritional qualities associated with the pigments that give them their hue. Eating the rainbow is not only pleasing to the eye but is good for your overall health.